When I want a decadent pasta dish, this Mushroom Parmesan Chicken is one of my favorites. The wine really makes this recipe for me….it gives the chicken such a wonderful flavor. But if you aren’t a wine drinker or don’t like the flavor of wine, you can use chicken broth in place of the wine. Though, I don’t really feel like it has the same oomph that way, so I wouldn’t recommend it, if possible. There’s something about the flavors of white wine and Parmesan cheese that just make me…well, for lack of a better word, salivate. The chicken turns out so tender and juicy, and the portobello mushrooms add a nice hearty, earthy flavor. Truly a delicious Weight Watchers chicken pasta recipe that is worth every single one of it’s 8 Points value. Pair with a light salad for a perfect meal! 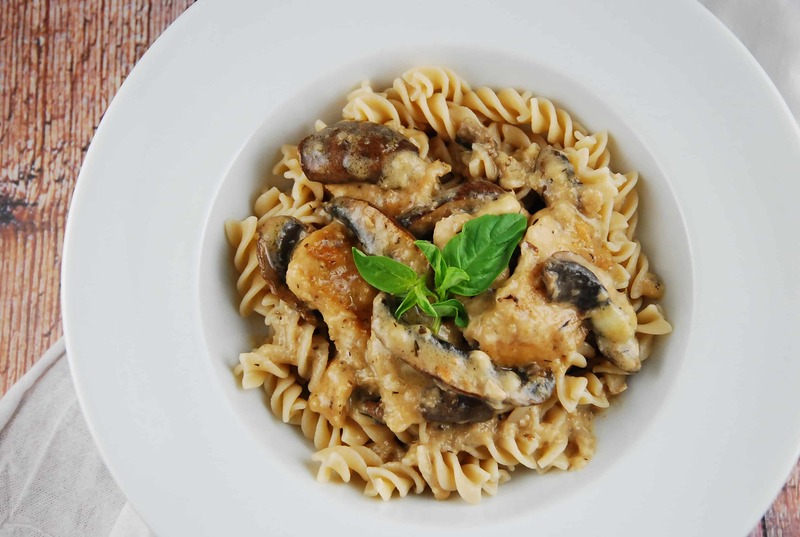 Moist chicken cooked in a creamy mushroom, wine, and parmesan sauce and served atop whole wheat pasta, makes for one seriously good Weight Watchers dinner. This tastes decadent and satisfying! While pasta is cooking, set a large non-stick skillet over medium high heat and mist with cooking spray. Season chicken breast strips with salt and pepper, and add into the skillet. Sauté until golden brown on both sides, about 3-5 minutes per side. Add in the chicken broth as needed to keep the chicken tender and from sticking to the pan. Remove chicken from pan and set aside. Using the same skillet, add in butter and melt, then add in the garlic and mushrooms. Cook until mushrooms become very tender, about 5 minutes. Return the chicken to the skillet, along with the wine, oregano and basil. Bring to a boil, then reduce heat to low, cover, and let simmer for about 15 minutes, or until most of the wine has cooked off. Spoon pasta evenly into 6 serving bowls, and top with the chicken mixture. ABSOLUTELY WONDERFUL!!!! My hubby is in love! I loved it! It’s WW! Score! My sauce never thickened even letting it boil longer with the top off or simmering. it stayed the same consistency as broth. I made this exactly as posted and my sauce never thickened past the consistency of a broth. I even simmered it without covering it. Is there something off in the liquid ingredient measurements? Is there a particular wine you like to cook with? When I’m cooking with white, I tend to use a Sauvingnon Blanc because I prefer that taste….but I don’t think it matters too much. Can I eliminate the white wine? Thanks. Yes, you can use chicken broth in it’s place. This looks great! Do you think it would be okay to use skim milk instead of reduced fat? I never have reduced fat on hand. Yes, but it may be a bit thin, so you might need to use a bit less.